Cannabis stocks are on fire Tuesday after a three major national surveys of U.S. citizens showed support for legalization is at an all-time high, according to Vox. The latest survey, the recently released General Social Survey by the NORC at the University of Chicago, showed 61% of Americans supported marijuana legalization in 2018, up from 57% two years prior in 2016. In 2000, just 31% supported legalization — a monumental shift in public opinion and a doubling of support in less than 20 years. The other two surveys showed similar results. A Gallup poll showed a staggering 66% of people supported legalization, up from 60% in 2016 and 31% in 2000. A Pew poll showed 62% support in 2018, up from 57% in 2016 and also 31% in 2000. 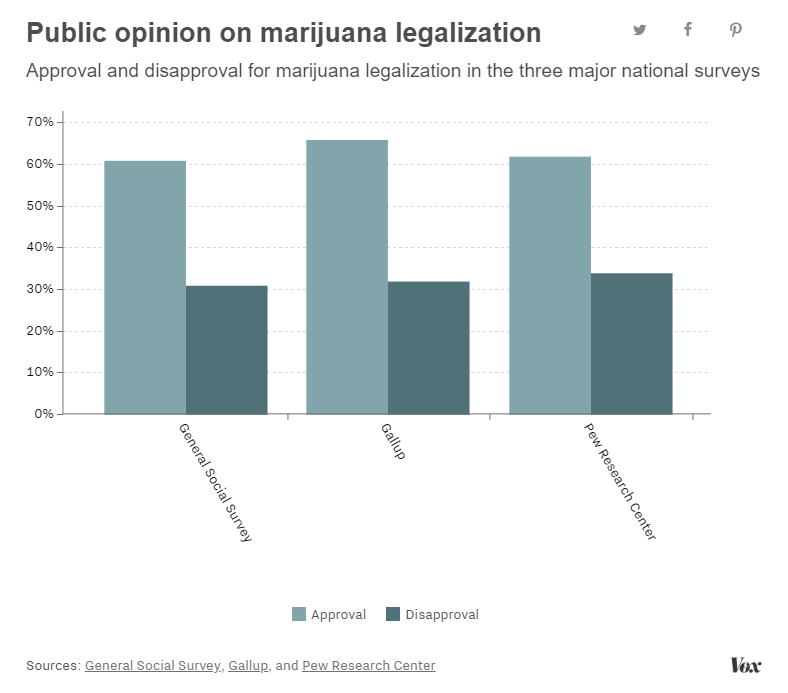 The dramatic turn in public opinion shows in 2020 candidates’ policies, and the vast majority of Democrats seeking a presidential bid support marijuana legalization. Ten states and Washington, D.C. have legal cannabis to varying degrees, gained through ballot initiatives and legislation. President Donald Trump also has shown evidence of growing support for legalization, with Money Morning’s Tim Melvin proclaiming Trump himself will back the movement heading into the 2020 election because it appears to be a winning issue where he can beat Democrats to the punch. Melvin called it the “last piece of the puzzle” and a move that will unlock uncountable billions in profit potential for investors. Trump’s fiscal 2020 budget request also asked Congress to revert to less-restrictive language to loosen legalization restrictions in Washington, D.C.
News of the positive polls sent cannabis stocks soaring across the board on Tuesday. Canopy Growth, the leader in market cap worth $13.63 billion, rose more than 5% in early trading and was up about 4% at 1:45 EDT. Canopy Growth is up a staggering 2,139% since it first debuted on Canadian markets exactly five years ago. Aurora Cannabis appeared to be the day’s biggest winner, rising steadily the entire day and sitting above 5% in afternoon trading on news that it had acquired the remaining stakes in Hempco Food and Fiber, a CBD company. CBD, or cannabidiol, is a popular natural remedy rising for a number of ailments that doesn’t contain THC, the compound in marijuana that get’s people “high.” CBD is generally derived from hemp, which doesn’t contain THC. Tilray was up nearly 4% in early trading and was up more than 2% in the afternoon. Cronos Group rose 3.5% in early trading before settling in up 1.5% in the afternoon. Full disclosure: JT Crowe owned U.S.-traded stocks in Canopy Growth and Aurora Cannabis as of this writing.